Lithium grease suitable for commercial and residential use. Protects against rust and friction all moving metal parts in machinery and equipment. Maintains its fluidity over time and provides excellent lubrication that withstands time. 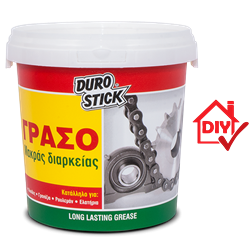 Suitable for lasting lubrication of gears and bearings, cables as well as pumps and pistons, door and window hinges. Prevents odor leaks from metal and plastic sewer covers as well as floor drain covers.